Your windows perform many functions from your home. They enhance your home’s style, let sunlight in, provide great views, and contribute to your home’s energy efficiency. If your windows are worn down, old, and no longer able to perform these functions, then it’s time for a replacement. Kroll Construction will explain the things you have to consider when getting a window replacement in Michigan. Michigan is no stranger to thunderstorms and tornados, averaging 30 days of thunderstorm activity and 17 tornados per year. Combine this with up to 40 inches of precipitation each year, and your replacement windows would have to be very weather resistant to protect your home. We provide our customers high-quality window replacement in Michigan and that’s why we have partnered with Alside. High-Performance and Impact Windows from Alside are thoroughly tested for air and water resistance and are able to perform under the most destructive weather conditions. Hail, strong winds, and heavy rain would be no problem for this window. Select this window if severe weather conditions are a concern. Your windows can serve as highlight to your home’s architectural design and as a way for you to express your own style and taste. It would be best if your choice of replacement windows has a wide selection of colors and styles. Replacement windows from Alside come in nine exciting colors and seven elegant woodgrain interior finishes. They also have a lot of decorative glass options and different caming choices, along with different grid styles. With so many possible combinations, we can easily help you design the perfect window for your home. Energy efficiency is another primary consideration when you undergoing window replacement. As one of the leading window companies in Michigan, we made sure to offer you one of the most energy-efficient replacement windows in the market. Alside’s Sheffield® Windows features a fusion-welded frame that increases its strength and creates a permanent barrier against air leaks. Its multichamber design can trap dead air to create an effective insulating barrier. These windows also utilize the Intercept Spacer System, which helps reduce conducted heat loss through the window. 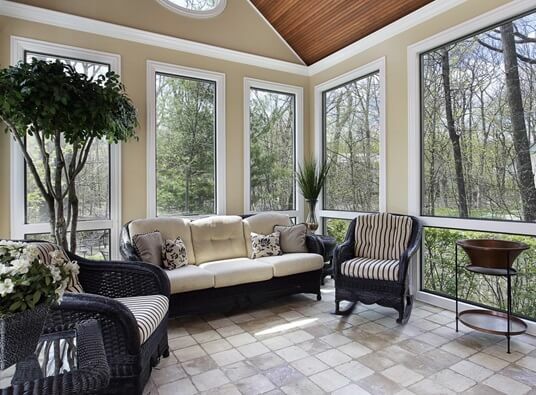 Finally, the ClimaTech insulated glass package repels unwanted solar heat through its low-E coating. These features all come together to help reduce your energy bill. Choosing the right window replacement involves many factors, including your home’s architecture, location, and your personal circumstances. Kroll Construction has over five decades of experience, and our window specialists can help you determine the replacement window that best suits your needs. Give us a call to learn more about our replacement windows or our other products and services. We also offer a free in-home consultation.